i first found these on joy the baker's site. and i heard my sister talk about pretty much the same recipe, so i had to try it. and i'm soooooo glad i did. best peanut butter cookies of my life! and since they don't have any flour, it's pretty much pure protein at that point, right? sure, whatever. preheat oven to 350°. in a mixer combine peanut butter and sugars until well combined, about 2 minutes. add egg and baking soda and mix for another 2 minutes. roll into walnut sized balls and create a cris-cross pattern with a fork, dipped in sugar. bake for 10 minutes, until lightly browned. Yes. Totally healthy. I'm so excited to try these!!! Thank you!! After going gluten free, I'm all about flourless yummies. I can't wait to try them out. 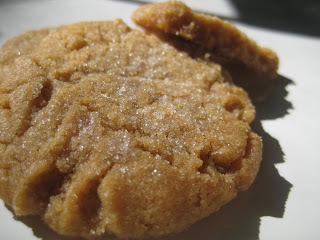 I had peanut butter cookies on my mind this morning...your post couldn't have been better timing! Thank you! Made them...and guess what...they are in incredible. THANK YOU! i think im trying again and reducing the sugar quantity and not dip them in sugar.